Love or hate them, it’s hard to deny that tablets have been stuck in something of a rut for a few years now, Android tablets especially. 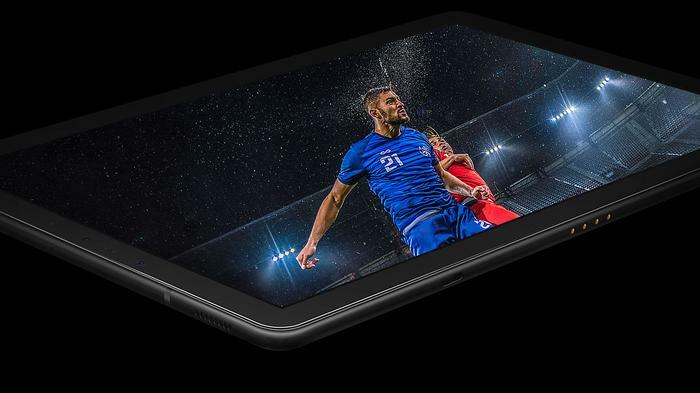 With the initial gold rush excitement around the category now dissipated, most consumers who want to buy a tablet will just go straight to the easiest option. They’ll either grab themselves an iPad, or opt for some of Microsoft’s Surface hardware - or one of its many imitators - if they need access to something that only Windows can offer. For a while now, Android tablets haven’t had a dedicated place in this status quo. This isn’t to say they don’t have value or something to offer - but it does say something about the nature of Android tablets. In the face of the consumption-first approach of the iPad and the productivity-first angle of the Surface, most alternatives are left with a foot in both camps. And in most of the ways that matter, the new Samsung Galaxy Tab S4 is no different. Samsung’s latest flagship tablet makes the case that - if you are looking to buy an Android tablet - this is pretty much as good as it gets. And, in fairness, the Tab S4 is the company’s most accomplished tablet yet. Yet, despite its myriad strengths and innovations, the Tab S4 doesn’t solve any of the foundational issues around Android tablets. It might well be the best option on the menu, but for most people, it’s going to be yet another tablet for those who can’t decide between a Surface and an iPad. 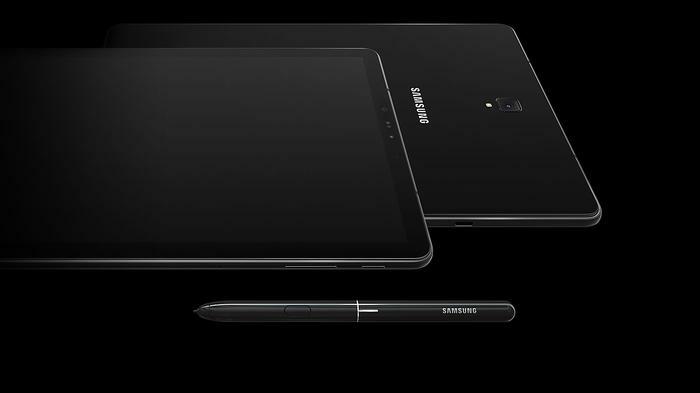 What Do The Specs Of The Samsung Galaxy Tab S4 Look Like? What’s Good About The Samsung Galaxy Tab S4? 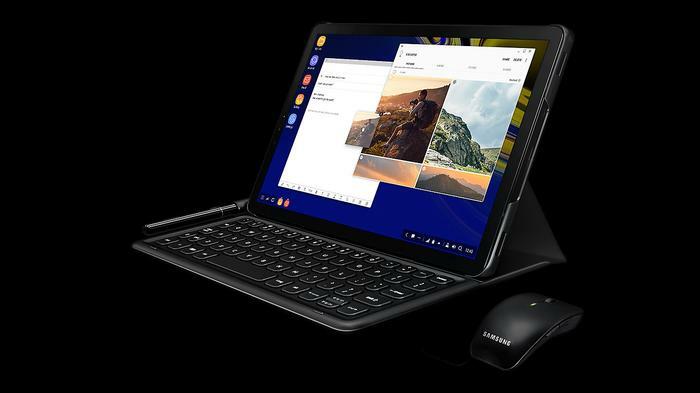 Again, it’s temptingly easy to see the Tab S4 as an extension of everything Samsung are already doing in the mobile space. Year in and year out, their Galaxy S and Galaxy Note devices are critically acclaimed and commercially successful. If you liked or like the way those devices look and feel, you’ll probably like what the Samsung Galaxy Tab S4 has going on. It’s basically that same story rewritten in a larger - but necessarily more impactful - font. It’s bigger but blowing things up has erased some of the finer details. More on that later. First of all: the good news. Again, if you're a fan of the all-glass aesthetics found in Samsung’s smartphones, you’ll probably like the look and feel of the Tab S4. If you liked watching video content on the Galaxy S8 or Note 8’s screen, you’ll probably like the way it looks on the Tab S4’s screen. 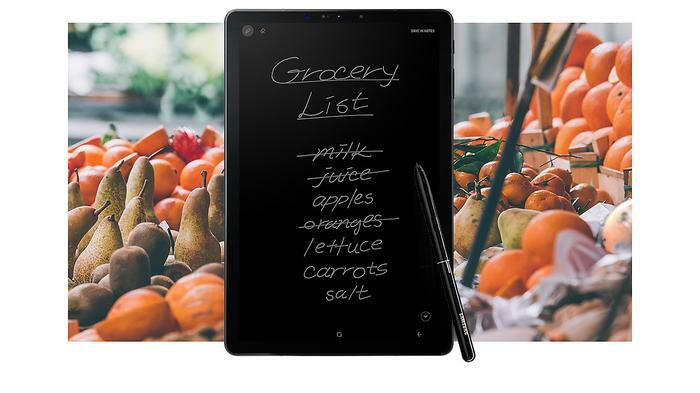 If you liked taking notes on the Galaxy Note 8 with the S-Pen, you’ll probably like taking notes on the Tab S4 using the S-Pen. At the end of the day, the fundamental strengths of the experience Samsung offer in their Android powered smartphone space translate over to the larger form-factor in a way that’s compelling. Or at least compelling enough. Out of the box, the Tab S4 has a great display, slick software, a chunky battery and a set of Dolby Atmos-capable quad-speakers that have been tuned by AKG.The Tab S4 features both a headphone jack and Micro SD support. It even supports the same level of iris-scanning biometric security as its smartphone cousins. If you’re a person who primarily intends to use your Android tablet for entertainment, all the right boxes have been ticked here. Meanwhile, on the productivity side, Samsung have opted to invent a few new boxes wholesale. All in all - It’s a familiar Samsung formula but, moment to moment, it does the trick. The final piece of the puzzle here is the ecosystem of accessories that orbit the Tab S4. There’s a slightly reworked S-Pen - which can be used for all manner of usual things. Again, this is all pretty similar to the the Note 9. Writing notes in meeting with the S-Pen proved surprisingly responsive. That said, I did find myself missing the sleeker form-factor of the S-Pen that comes with the Galaxy Note 8 and Note 9. The Tab S4’s S-Pen is much bulkier by comparison and the fact that you can’t stow away the stylus away inside the tablet seems like a real wasted opportunity for the feature. Then, there’s the keyboard-case. Priced at a hefty $199, this case adds an extra layer of protection (and further bulk) to the Tab S4. It also adds the ability to use a keyboard with most - but not all - Android apps. Unfortunately, the keys themselves proved a little too small for our purposes. Typing on this thing often felt cramped and constrained. I couldn’t just let myself go on autopilot as I usually do and I found myself making a lot more mistakes with it. And in addition to just using this keyboard to type notes and web browser, we also tested out the keyboard on the Tab S4 by streaming some PC games to the tablet using Valve’s Steam Link app. Though this worked well enough over our local wireless network, it highlighted another unique problem: the Tab S4’s keyboard features no escape key - which is super-odd. Obviously, this use-case is pretty niche but it’s a shame nevertheless. 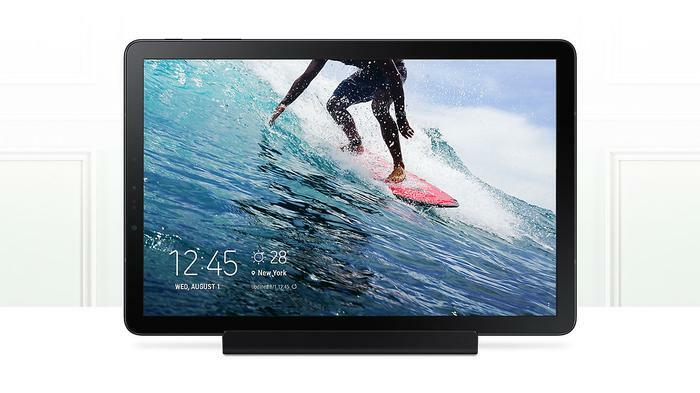 Can This Tablet Replace My Primary Computer? For what it’s worth, the Samsung Galaxy Tab S4 does get much closer to the oft-promised-but-rarely-realised promise of being the tablet that you could use to replace your primary computer than most Android tablets do. This time around, Samsung have placed their chips here on a new implementation of the DeX experience previously found in their Galaxy S and Galaxy Note smartphones. 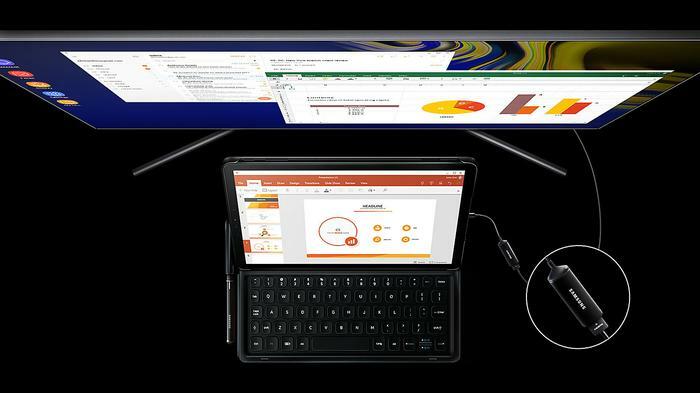 DeX can be enabled either manually through the Android shortcuts menu or automatically when you snap the tablet into a standing position in the official keyboard case. When it comes to enabling you to use DeX, Samsung have done well to minimize friction. However, at the end of the day, this is still DeX. App compatibility is still a crapshoot, web-browsing can be a pain and most Android experiences simply aren’t designed to be used with a mouse and keyboard. The absence of any sort of USB ports is another drawback. It remains a real shame that Samsung don’t use the larger size of the Tab S4 to do things that their Galaxy smartphones can’t. My experience here isn’t going to be universal. I can’t speak for every kind of work and productivity use-case involved. However, in my experience, the workflow gymnastics involved mean that while using the DeX is an option - it’s still one I’m reticent to recommend. What’s Not So Good About The Samsung Galaxy Tab S4? There are, of course, a few other caveats. For one, the biggest competition for this tablet really is the Apple iPad Pro - which is conspicuously more-affordable compared to Samsung’s heavyweight Tab S4. Sure, you lose out on the freedom offered by the Android ecosystem and critical hardware capabilities like micro SD support and a headphone jack - but cheaper is still cheaper and if you’re after an everyday tablet experience, I’m not convinced the caveats here justify the higher price-tag. And while the Tab S4 does echo a lot of the strengths of its smartphone counterparts, it doesn’t offer the same breadth of durability features, nor does it come with support for flagship perks like wireless charging. The display isn’t quite as crisp or capable as that found in the Galaxy Note 9 and the camera falls even further short of the mark. In fairness, I’m not necessarily convinced that having a high-performance camera on a tablet is necessarily a priority - but it does serve to illustrate the lingering faults in the experience. If you're going to build the high-performance Android table that has it all and the price-tag to match, make the high-performance Android tablet that has it all. Going from the 6.4-inch display on the Galaxy Note to the Tab S4 never felt like the bump upwards it should be. If anything, it felt like the nuance and quality of that experience was lost. There’s no Bixby here. It feels odd to say aloud but its absence is invariably noted. The display, while Super AMOLED, lacks the HDR compliance, thinner bezels and higher resolution found in the Galaxy Note 9. The S-Pen while still good enough to use, just isn’t as nice as the one in the Galaxy Note 8 and 9. Bottom Line: Should You Buy The Samsung Galaxy Tab S4? Simply put: if you’re looking to buy an high-performance, premium Android tablet, the Samsung Galaxy Tab S4 should sit somewhere towards the top of your list. However, if you’re looking for a reason to buy an Android tablet at all, I’m not 100% convinced you’ll find it here. The software is nice, and the hardware is nicer - yet the Tab S4 falls into all the usual traps and tropes of Android tablets. They’re an solution to a problem that few, if any, mainstream users really have. For all that Samsung have done to differentiate and shore up the software side of their Android tablet experience, they’ve done little to play up and explore the opportunities that a larger form-factor presents. At times, the Samsung Galaxy Tab S4 feels like a Galaxy Note with a larger screen, bigger battery and none of the premium perks. When it comes down to it, I can’t help but feel like the Tab S4 is an opportunity wasted. It's not a bad product. There’s plenty to like about the Galaxy Tab S4. But it rarely commits enough to be what it could be. With Google and others shifting their focus towards ChromeOS, nobody is really doing anything interesting with Android tablets. Samsung have the ability - and the capability - to change that. They've opted for the comfort of the familiar here instead - which is inevitably a little disappointing.